Next in ToC: Decadent Yes, Vegan Also Yes! I made this vegan parmesan focaccia recipe for a couple of dedicated carnivores on a Saturday afternoon a couple of weekends ago while we were killing time before a concert (and killing a bottle of meaty Spanish red). Served with olives on the side, it was a perfect accompaniment for bad jokes and general BS about our exploits over the last three decades. The loaf lasted just about as long as the wine, which is exactly how you want it. 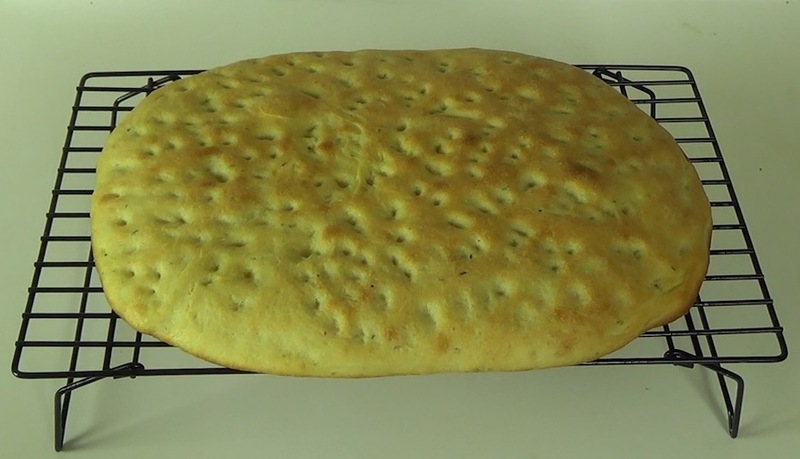 I based the focaccia bread itself on this excellent recipe from Food Wishes, which also includes a step-by-step video of the process. 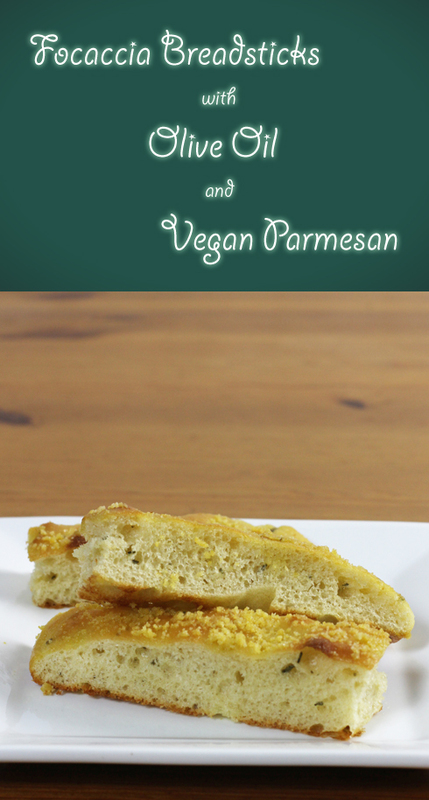 The vegan parmesan comes from Vegan in the Freezer, and it's a regular favourite of mine. 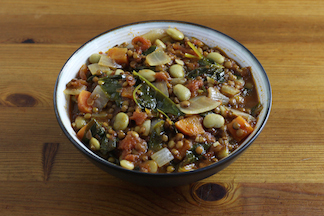 I particularly love how the garlic, umami and salty flavours play together in just the right proportions. 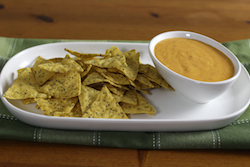 It really could not be easier to make—four ingredients and 30 seconds in a food processor. 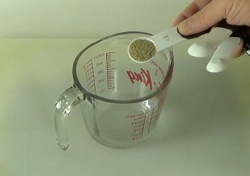 Warm up the water in a small measuring cup. Pour all but 1/4 cup into a large mixing bowl and set aside. 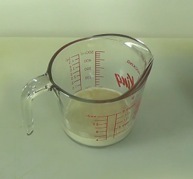 With the remaining 1/4 cup in the measuring cup, mix in an optional pinch of sugar and the yeast. 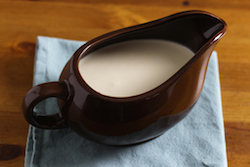 Let the yeast get frothy and double in volume over five minutes or so. While the yeast is proofing, add 2 Tbl olive oil to the water in the large mixing bowl, measure out the flour and get your kneading board ready. By the way, kneading is a lot more fun if you put the board on a kitchen counter instead of your table—the extra height of the counter makes it easier to get your shoulders and back involved—it really is easier and more enjoyable. 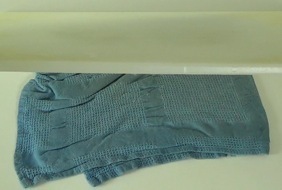 Also, if you get annoyed by the kneading board sliding around like I do, try putting a damp, folded tea towel underneath. Pour the proofed yeast into the mixing bowl. 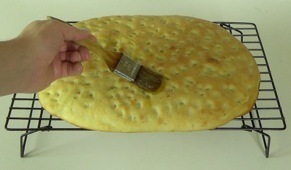 Add a small amount of flour and mix well with a wooden spoon. Continue adding small amounts of flour and mixing until you have roughly the consistency of thick pancake batter. 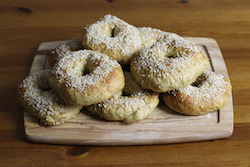 At this point, add the minced rosemary, salt and semolina. 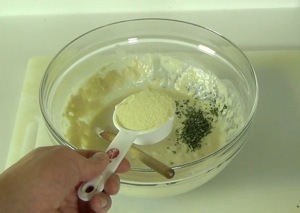 Continue adding flour and mixing (switching to hand mixing when it gets too thick for your spoon). When the dough starts to look a little shaggy (as shown) but is still sticky, turn it out onto your kneading board. You want to knead for about 300 strokes. (Most people knead for a set amount of time, but I like counting better.) 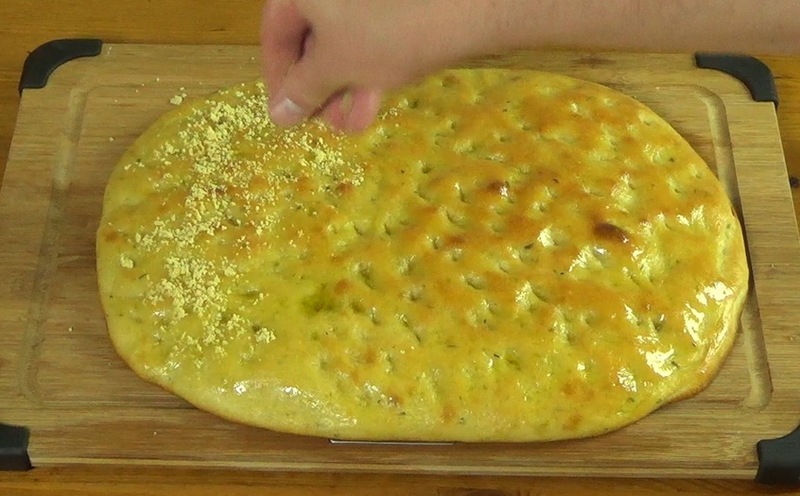 I usually knead with one hand so the other hand doesn't get sticky and I can use it to add more flour as needed when the dough sticks to the board. I can also use the free hand with a dough scraper to lift the dough off the board when it sticks. 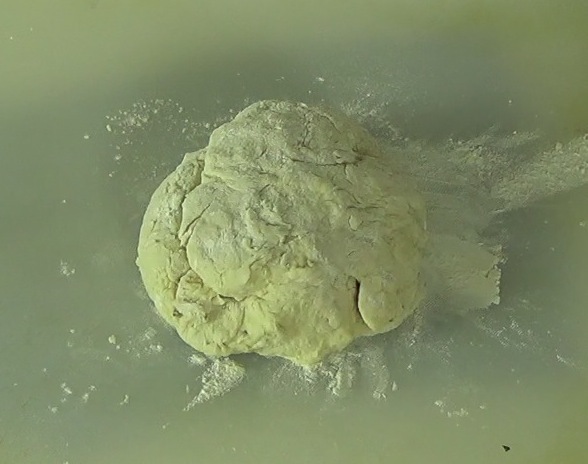 Be careful with the amount of flour you add in. Add it gradually and in small amounts, kneading a lot between additions. 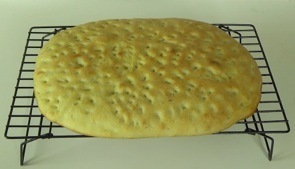 A little stickiness is desirable and you definitely don't want to add too much flour or the bread will be heavy. 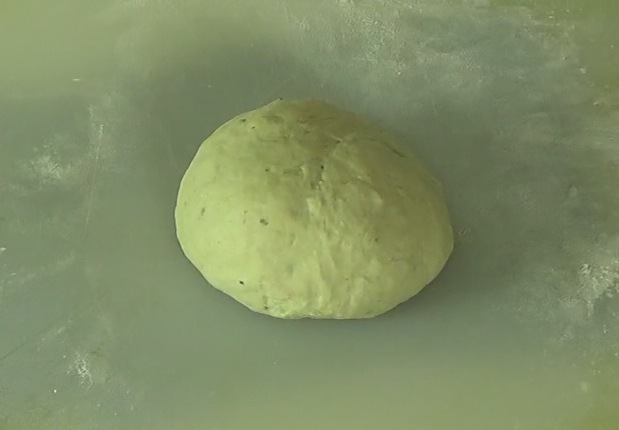 After about 10 minutes (or 300 strokes), the dough will become more springy and take on the texture of your earlobe. Knead in the other 2 Tbl olive oil (1 Tbl at a time, kneading a lot in between). 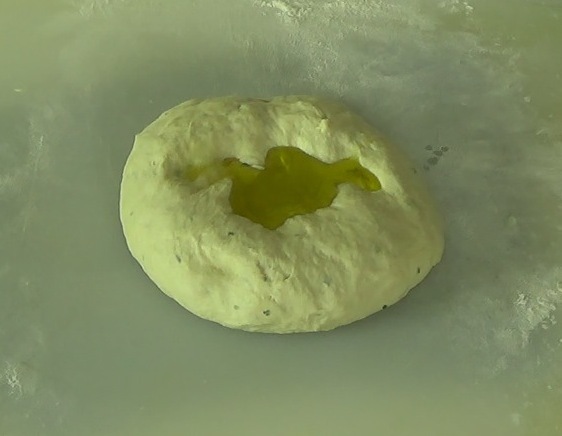 When you first add the olive oil, you'll probably feel like the dough is ruined because of how ropey and slippery it gets. 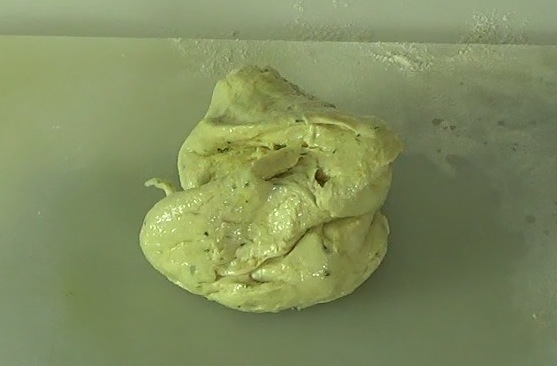 But as you continue kneading, the oil gets magically incorporated and the dough becomes smoother and more beautiful than before. 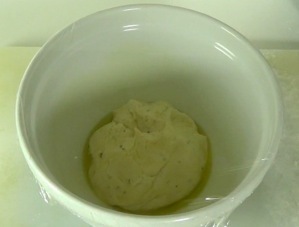 After the 2 Tbl olive oil are fully incorporated, place the dough in a clean, oiled bowl and cover with plastic wrap. 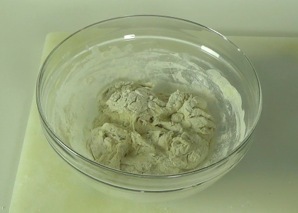 Put the dough someplace warm and draft-free to rise for 60-90 minutes, until doubled in volume. I use my oven, turned off, with a 9X13 pan filled with super hot tap water on the bottom rack. 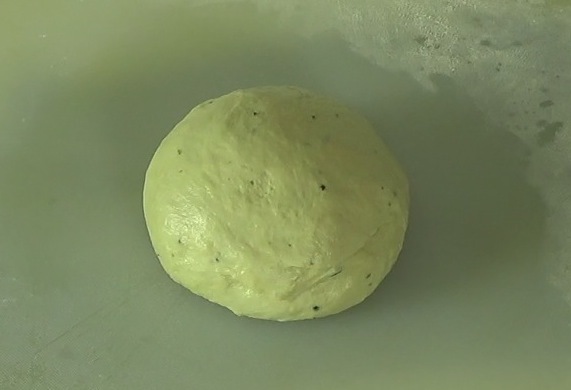 Remove the plastic wrap and gently press the dough flat against the bowl, expelling gas bubbles that accumulated during the rise. 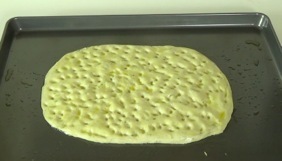 Oil a large baking sheet and place the flattened dough on it. 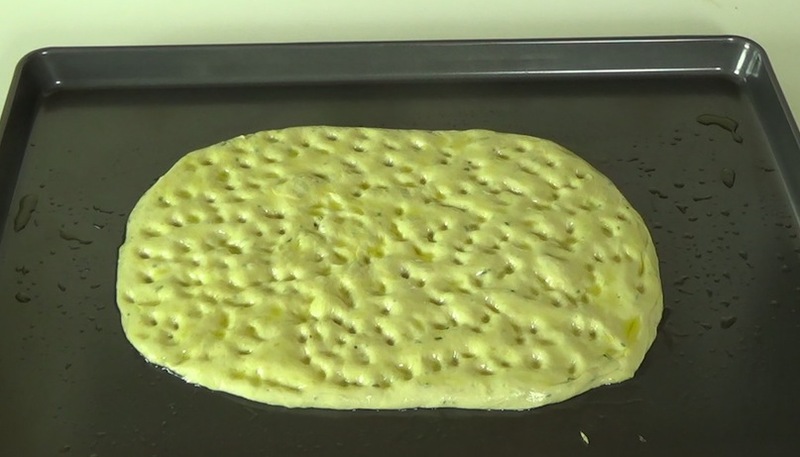 Gently convince the dough that it wants to be in a rough rectangle shape. 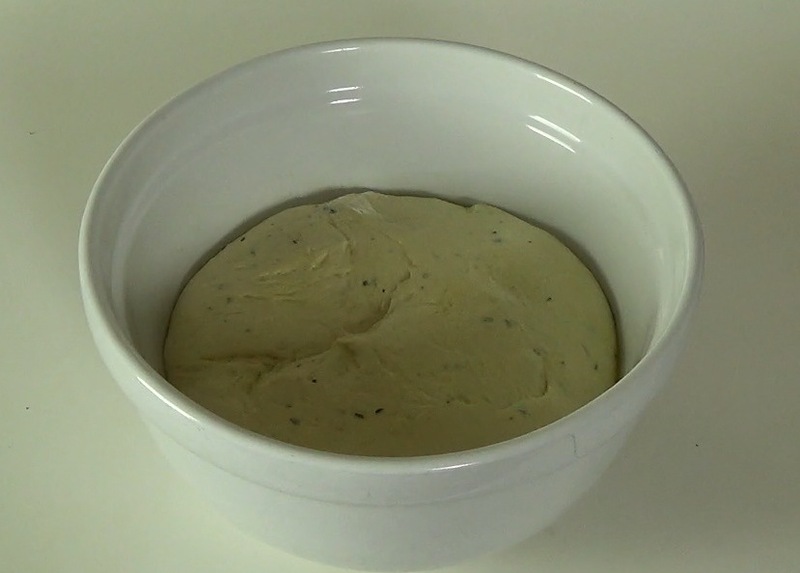 Cover the dough loosely with plastic wrap and let it rest 15 minutes. 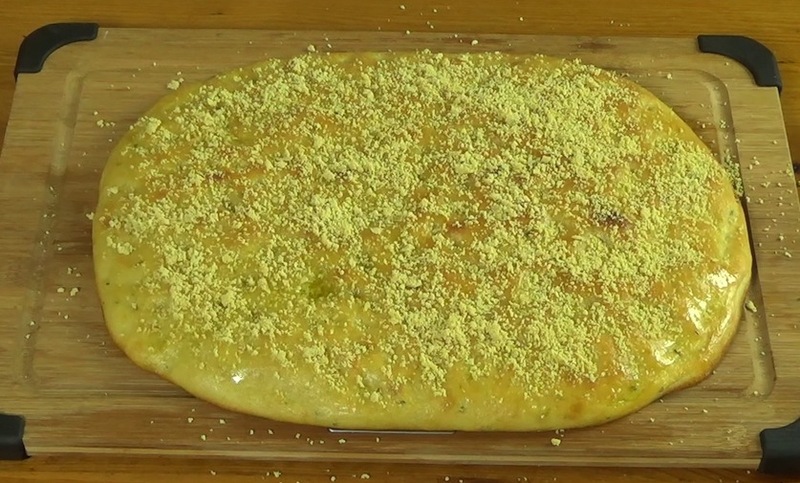 Remove the plastic wrap and drizzle with olive oil. Poke liberally with your fingertips, going all the way through. 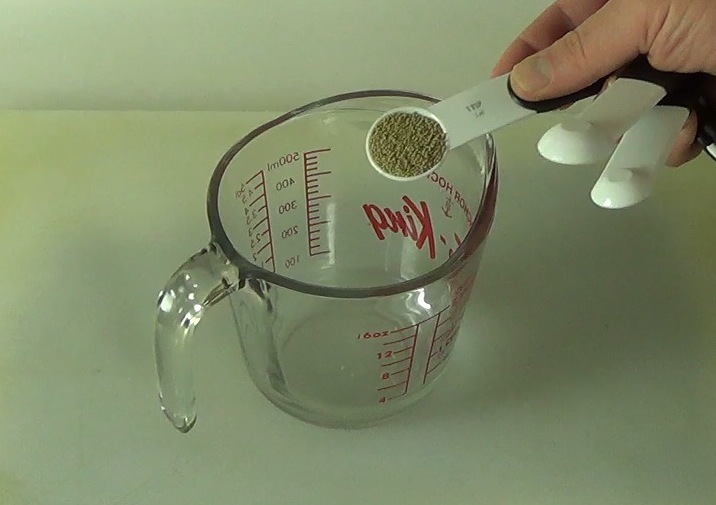 Start out with 4 fingers and then reduce to 1 finger so you can focus on the unpoked areas. 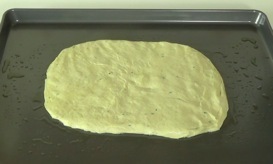 Return the dough to the warm place and let it rise again for 45 minutes. After 30 minutes, preheat the oven to 475 °F. 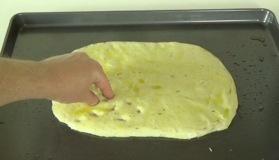 After the dough is finished proofing, gently brush it with more olive oil and put it in the oven. 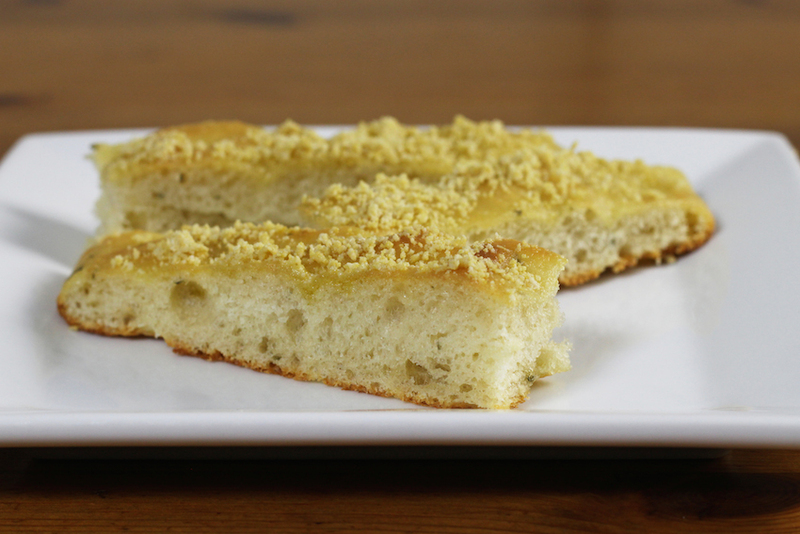 Bake for 10-12 minutes until the focaccia is golden. Keep an eye on it, it's very easy to overcook at this temperature. Brush with olive oil while still hot. 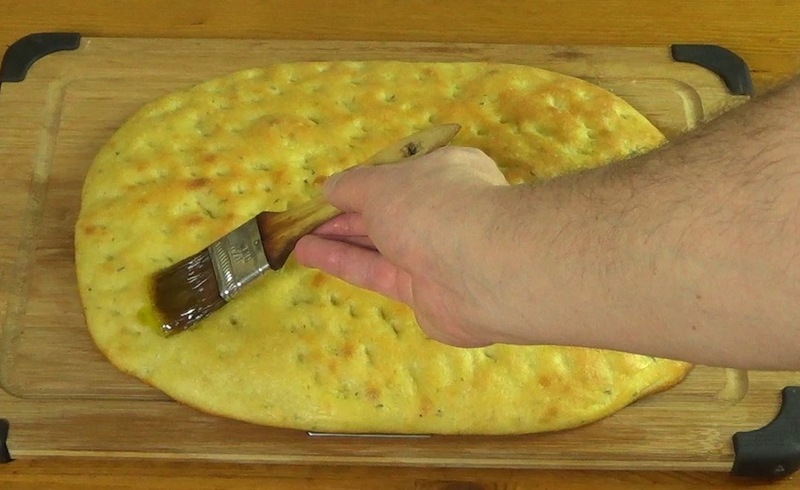 After the focaccia has largely cooled (an hour or so), remove to a cutting board and (you guessed it) brush with more olive oil. 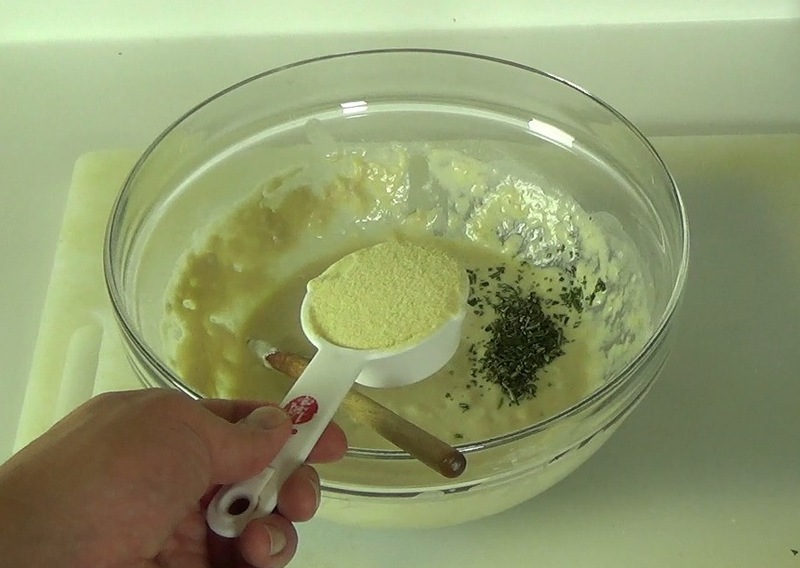 Sprinkle liberally with the delightful vegan parmesan. 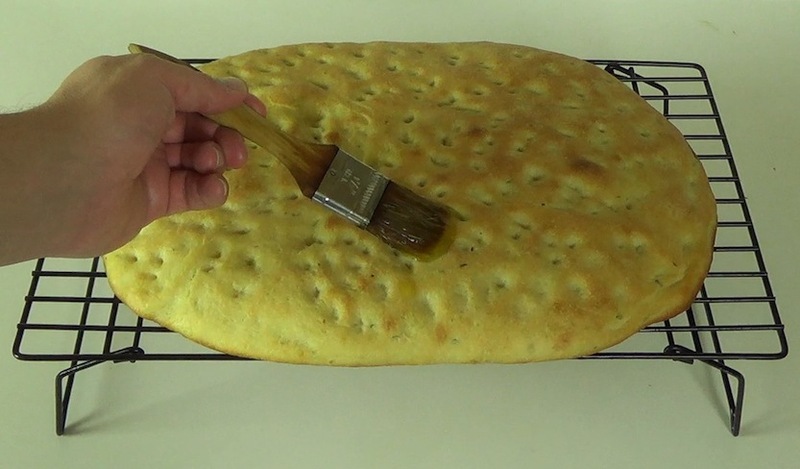 Slice into breadstick sizes and serve.